Principles in the form of heuristic guidelines or generally accepted dogma play an important role in the development of physical theories. In particular, philosophical considerations and principles figure prominently in the work of Albert Einstein. 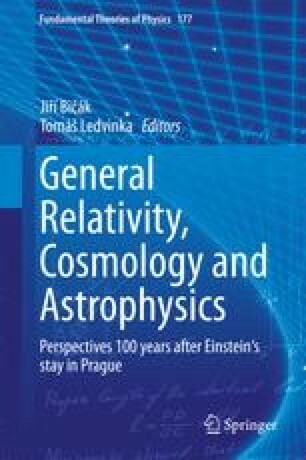 As mentioned in the talk by Jiří Bičák at this conference, Einstein formulated the equivalence principle, an essential step on the road to general relativity, during his time in Prague 1911–1912. In this talk, I would like to discuss some aspects of cosmological models. As cosmology is an area of physics where “principles” such as the “cosmological principle” or the “Copernican principle” play a prominent role in motivating the class of models which form part of the current standard model, I will start by comparing the role of the equivalence principle to that of the principles used in cosmology. I will then briefly describe the standard model of cosmology to give a perspective on some mathematical problems and conjectures on cosmological models, which are discussed in the later part of this paper. I would already have concluded my researches about world harmony, had not Tycho’s astronomy so shackled me that I nearly went out of my mind. I would like to thank Jiří Bičák and Bernd Schmidt for their comments on an early version of the paper.